In 2015, The Mozilla Foundation launched the Mozilla Clubs program to bring people together locally to teach, protect and build the open web in an engaging and collaborative way. Within a year it grew to include 240+ Clubs in 100+ cities globally, and now is growing to reach new communities around the world. Today we are excited to share a new focus for Mozilla Clubs taking place on a University or College Campus (Campus Clubs). Mozilla Campus Clubs blend the passion and student focus of the former Firefox Student Ambassador program and Take Back The Web Campaign with the existing structure of Mozilla Clubs to create a unified model for participation on campuses! Structure: Campus Clubs include an Executive Team in addition to the Club Captain position, who help develop programs and run activities specific to the 3 impact areas (teach, build, protect). Training & Support: Like all Mozilla Clubs, Regional Coordinators and Club Captains receive training and mentorship throughout their clubs journey. However the nature of the training and support for Campus Clubs is specific to helping students navigate the challenges of setting up and running a club in the campus context. Activities: Campus Club activities are structured around 3 impact areas (teach, build, protect). Club Captains in a University or College can find suggested activities (some specific to students) on the website here. These clubs will be connected to the larger Mozilla Club network to share resources, curriculum, mentorship and support with others around the world. In 2017 you’ll see additional unification in terms of a joint application process for all Regional Coordinators and a unified web presence. 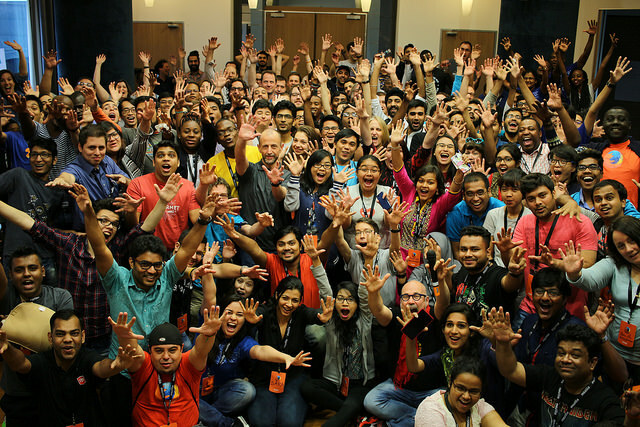 This is an exciting time for us to unite our network of passionate contributors and create new opportunities for collaboration, learning, and growth within our Mozillian communities. We also see the potential of this unification to allow for greater impact across Mozilla’s global programs, projects and initiatives. The Firefox Student Ambassador Program is now Mozilla Campus Clubs: After many months of hard work and careful planning the Firefox Ambassador Program (FSA) has officially transitioned to Mozilla Clubs as of Monday September 19th, 2016. For full details about the Firefox Student Ambassador transition check out this guide here. Firefox Club Captains will now be Mozilla Club Captains: Firefox Club Captains who already have a club, a structure, and a community set up on a university/college should register your club here to be partnered with a Regional Coordinator and have access to new resources and opportunities, more details are here. Current Mozilla Clubs will stay the same: Any Mozilla Club that already exists will stay the same. If they happen to be on a university or college campus Clubs may choose to register as a Campus Club, but are not required to do so. There is a new application for Regional Coordinators (RC’s): Anyone interested in taking on more responsibility within the Clubs program can apply here. Regional Coordinators mentor Club Captains that are geographically close to them. Regional Coordinators support all Club Captains in their region whether they are on campus or elsewhere. University or College students who want to start a Club at their University and College may apply here. Students who primarily want to lead a club on a campus for/with other university/college students will apply to start a Campus Club. People who want to start a club for any type of learner apply here. Anyone who wants to start a club that is open to all kinds of learners (not limited to specifically University students) may apply to start a Club here. Individuals who are leading Mozilla Clubs commit to running regular (at least monthly) gatherings, participate in community calls, and contribute resources and learning materials to the community. They are part of a network of leaders and doers who support and challenge each other. By increasing knowledge and skills in local communities Club leaders ensure that the internet is a global public resource, open and accessible to all. This is the beginning of a long term collaboration for the Mozilla Clubs Program. We are excited to continue to build momentum for Mozilla’s mission through new structures and supports that will help engage more people with a passion for the open web.